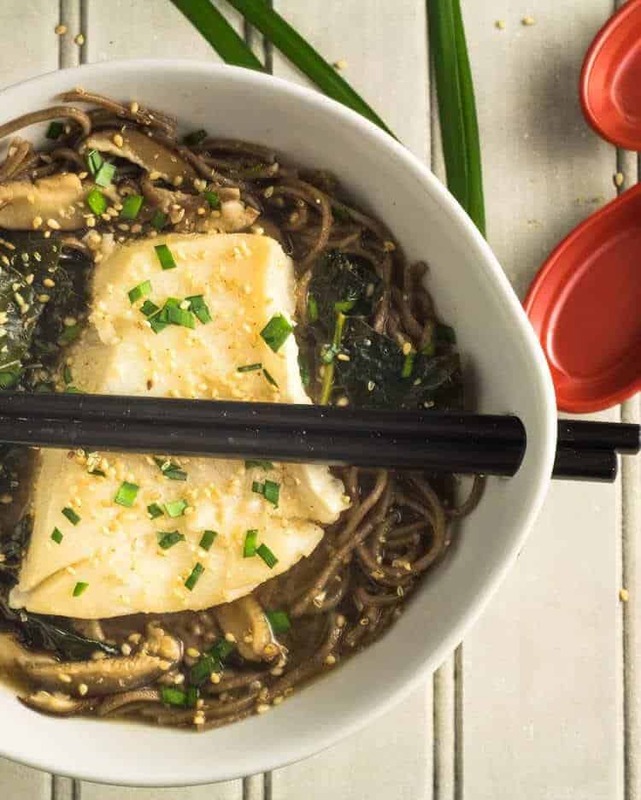 Savor all the umami flavor in this Ginger Mushroom Miso Poached Fish With Kale and Shiitake replete with ginger, garlic, and sesame in a savory miso broth. 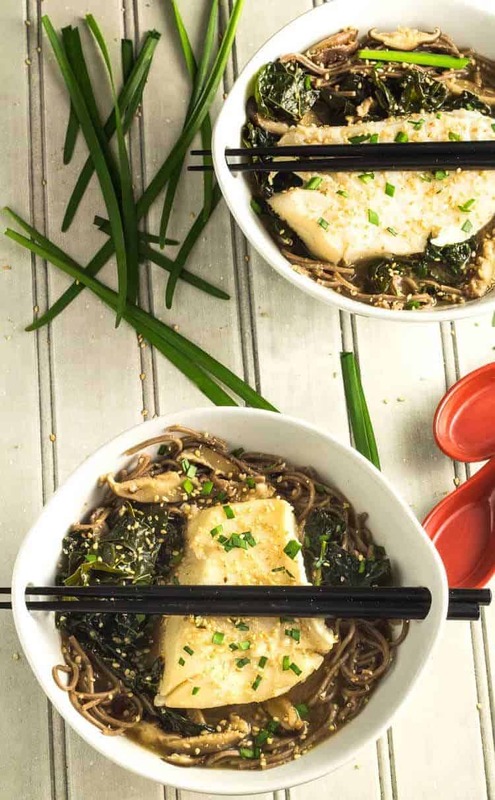 The tender white fish, hearty kale, and earthy shiitake mushrooms soak up all that delicious flavor… Served atop nutritious soba noodles, it’s a perfectly balanced meal in a bowl! Translation: If you only eat until your stomach is 8/10 full, you won’t need a doctor. Meaning: Eating in moderation is good for your health. I think the Japanese are on to something. 😀 I find eating smaller meals, with healthy snacks in between, is a great way to fend off hunger, stick with reasonable portions, and keep my weight in check. (No small task as a middle-aged woman). Lean proteins are so such an important part of a healthy diet, and we are fortunate to be able to include fish on a regular basis. 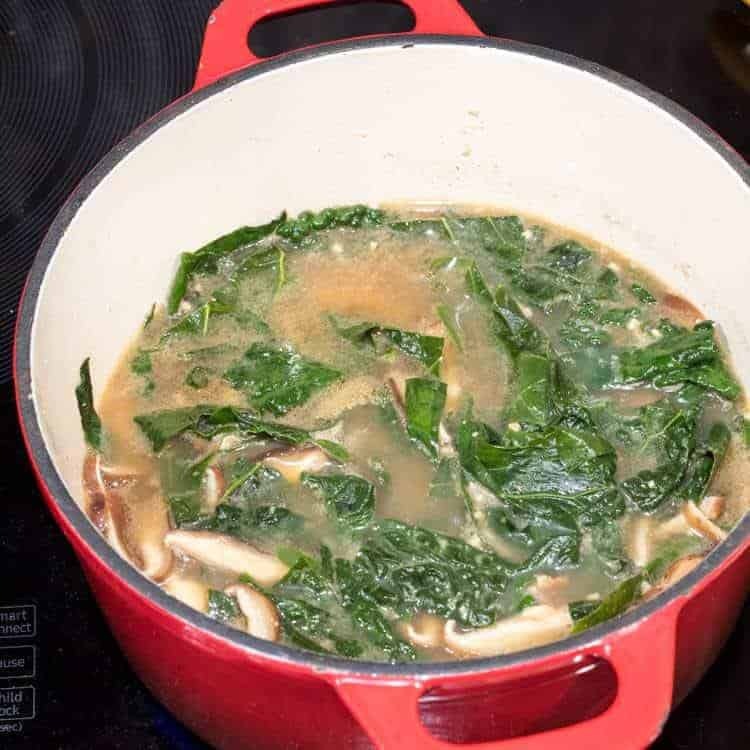 Place the noodles in a deep soup bowl, top with the tender greens and shiitake, top with a fish portion, then pour the simmering broth over the top. Garnish with toasted sesame seeds and chopped scallions or chives… A delicious and healthy one pot meal! We love our Asian soup spoons and chopsticks with this dish, but they’re totally optional! The main thing is to enjoy it! 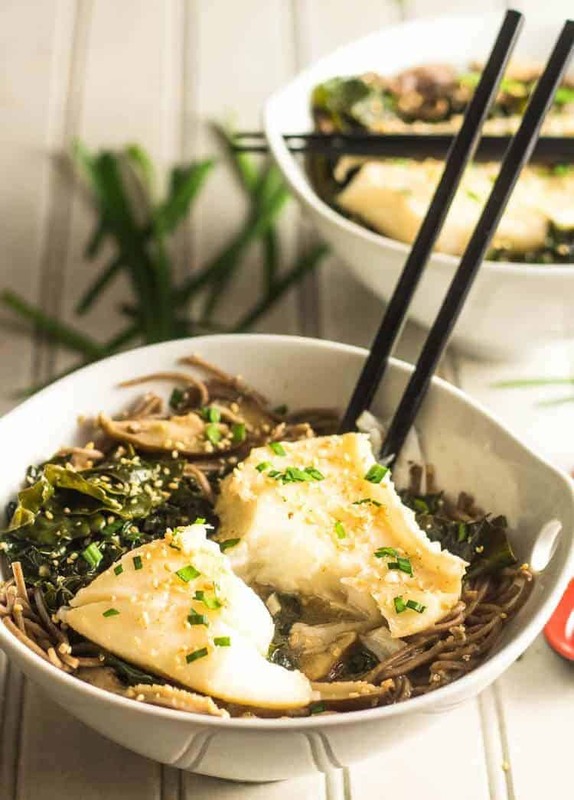 Savor all the umami flavor in this Ginger Mushroom Miso Poached Fish With Kale and Shiitake replete with ginger, garlic, and sesame in a savory miso broth. 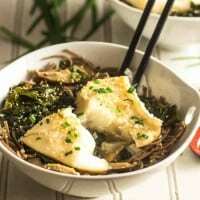 The tender white fish, hearty kale, and earthy shiitake mushrooms soak up all that delicious flavor... Served atop nutritious soba noodles, it's a perfectly balanced meal in a bowl! To a deep (not wide) pot, add the sesame oil, ginger, and garlic. Stir until fragrant - about 2-3 minutes. Add mushroom broth, rice wine (if using), tahini, tamari, and miso. Stir to combine. Bring to a simmer. On medium heat, add the fish, and simmer until opaque. 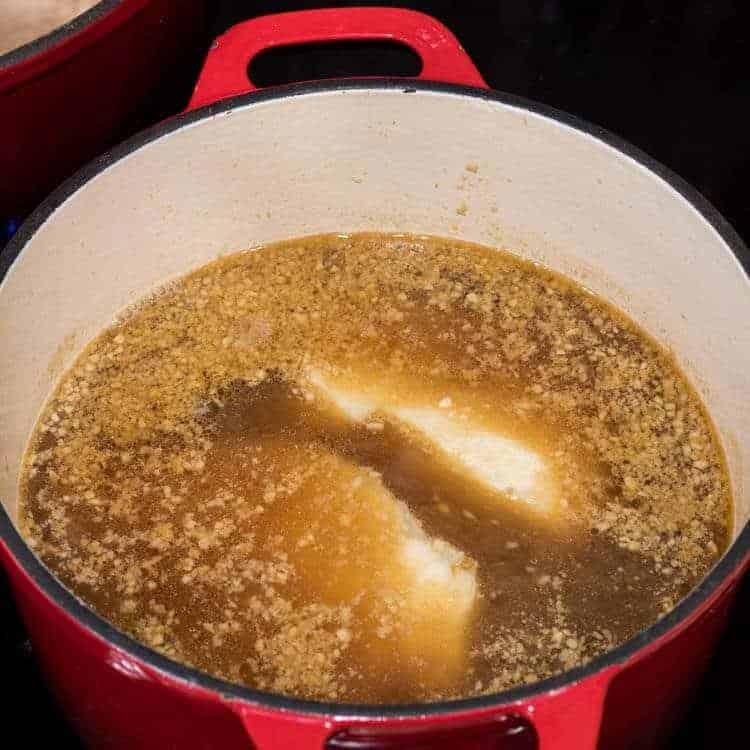 Depending on the thickness of your fish and temperature of the broth, it may take take 10-15 minutes. Using a slotted spoon, remove fish and set aside. Add the coarsely chopped greens and shiitake. Simmer until the greens are tender (7-10 minutes). Meanwhile, cook noodles according to package instructions. I use fresh soba which require only 2-3 minutes. I set the pot of water on to boil before I start the recipe. To serve, add noodles to a deep soup bowl. Add the greens and shiitake, and then a fish portion. Cover with the steaming hot broth. Garnish with toasted sesame seeds and some chopped scallions or chives. Enjoy! I typically use fresh soba which require only a couple of minutes to cook. I start my water when I start the broth. If you're using dried noodles/pasta, you may want to start the water first thing. Macronutrients (approximation from MyFitnessPal): 399 calories; 42 g protein; 10 g fat; 39 g carbohydrates. We've got some beautiful fish in the freezer that would be perfect for this amazing recipe! Thanks Muna! Fish is so healthy, I am always after new ways to prepare it! I definitely do not eat enough fish! This looks like an awesome place to start getting it back into my diet - looks delicious! I need to eat more fish and this recipe sounds amazing! This looks Fab Tamara, and so healthy!